I manage my father's Ancestry DNA profile, it's got the usual 4th/5th/6th cousins spread all over the world. Recently I got a hit on a "Distant Relative" (14cm) in the US who has the same surname, I found them on facebook, made contact & we exchanged a few details. Turns out they're the grandchildren of my grandfather's brother (my second cousins I think). There'd been some split in the family before my father was born & he buggered off to the US never spoken of again. His son (Irish born but now deceased), should be my father's first cousin & these children of (American born), would be his first cousins 1x removed or second cousins, right? 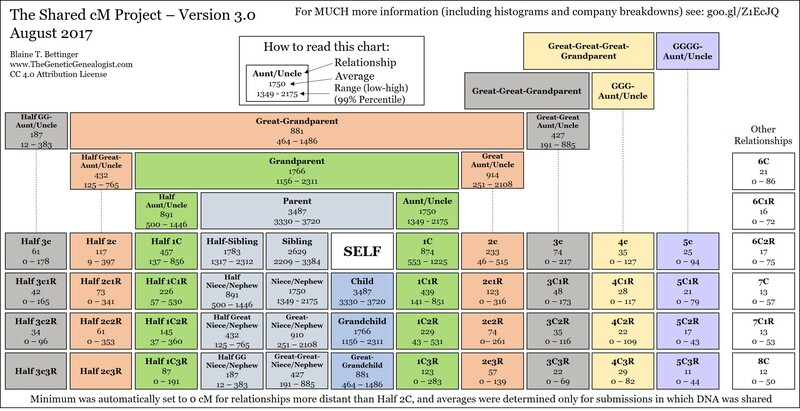 However the CM should be much higher & it should display at a closer relationship than distant relative, correct? 14cm is something like fourth cousin 2x removed sharing a great great great grandparent. Given the isolated island population of Ireland around that period, I suspect now that gramps & granny (both long passed), may have held a tightly guarded family secret. Any thoughts? Is Ancestry's algorithm total bull or is there more at play here? Maybe your grandfather's brother was adopted. If your family came from a small community the chances of being a cousin of some sort would be high. Do you have the brothers birth cert? Baptism record? Nothing wrong with ancestrys algorithm. DNA doesn't lie. Yes, have the birth certs of all concerned. He also appears on both census at appropriate ages that match. They had a large family with a couple of young deaths, but dates match. Had seen him on the census but couldn’t find anything on him until randomly came across his name on a passenger list. Can you load both kits onto Gedmatch and see what sort of share you get there? Grandchildren of siblings are second cousins. See the shared centimorgan chart done by Blaine Bettinger for the ranges of different relationships. There's a few possibilities: could they have been half-siblings? This would knock the share down. You seem to have already documented with records the relationship. Is there anyone else in the family of the same relationship to you both or nearer who could be tested? I suppose there's a chance they may have been half siblings although the certificates name both their parents the same (who knows what went on).